Humid. Warm. Damp. Lush. Trickling water. Harsh cry of a macaw. A thousand shades of green. Butterfly World. An indoor garden for tropical creatures. The only thing missing is the musty jungle smell of decomposing plant life. Tortoises, flamingos, koi fish, and geckos live happily alongside the hundreds of butterflies that glide from flower to flower. Above is Little E, (Eclectus). He tilts his head this way and that and eyes Miss A with interest. Beautifully coloured butterflies. The Lantana in the top right photo above is something we called the Fruit Loop Bush because of its multicolored blossoms. The only butterfly I recognize is the Blue Morpho (Morpho peleides), seen above. When the wings are closed, the spots are distinctive, but it's the iridescent blue on the inside of the wings from which it gets its name. Truly beautiful but hard to capture with the camera. I'm thrilled when one lands on my shoulder and stays there for 5-10 minutes while we wander around. Miss A snaps the photo of the open wings. 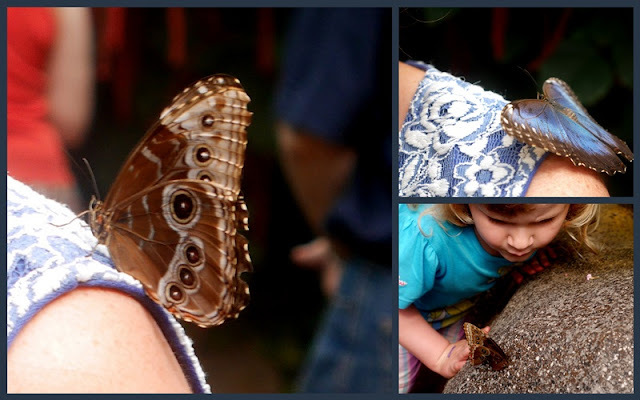 She is very careful not to touch any of the butterflies. Shadow is the resident blue and gold macaw. Less friendly than Little E, he appears to be the king of this particular jungle. A fun outing with a fun little girl. Ahhh...we may have goldfinches, but no blue morphos that I have ever seen anyway. You folks are having quite a summer...hot and humid. We are joining you at least for a few days...it's 9:32 p.m. and still 90F. Hot! What beautiful butterflies. I remember being so thrilled when the large Swallowtail visited our gardens in France. Such colorful shots. Love them. This does indeed look like a fun outing for your and your granddaughter. 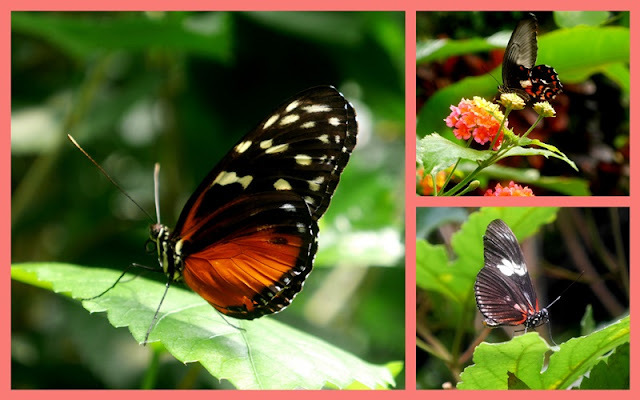 Lovely photos you captured of the butterflies and birds. The coloring on Little E is so vibrant and interesting. What a wonderful outing for you and Miss A, she has obviously inherited your talent with a camera, excellent photography! Good morning, awesome post of the wildlife. The butterflies and birds are beautiful. Looks like a fun place to visit with Miss A. Have a happy day and new week ahead! Sweet. You captured great photos of Little Miss so enthralled. Those birds are so so colorful. Looks like lots of wonders for her to behold! What a brilliant idea for a day out....I love how children are so enthusiastic, it doubles the joy! What a great adventure! You had a lovely day out with the littles. Beautiful color ... butterflies and macaws. Happy Monday! What amazing shots. I wanted to reach out and touch Little E.'s green feathers! Beautiful photos and it looks as if it was a great outing. We all need a butterfly on our shoulder! I love to see young people in a setting like this learning about the various critters. It's interesting for adults too as I'm always after my hubby to visit butterfly houses and such when we travel. Look at those beautiful butterflies! Hi! We looked your butterflies with my daughter. She said ooh and her mouth was like a circle. Look at those colors! 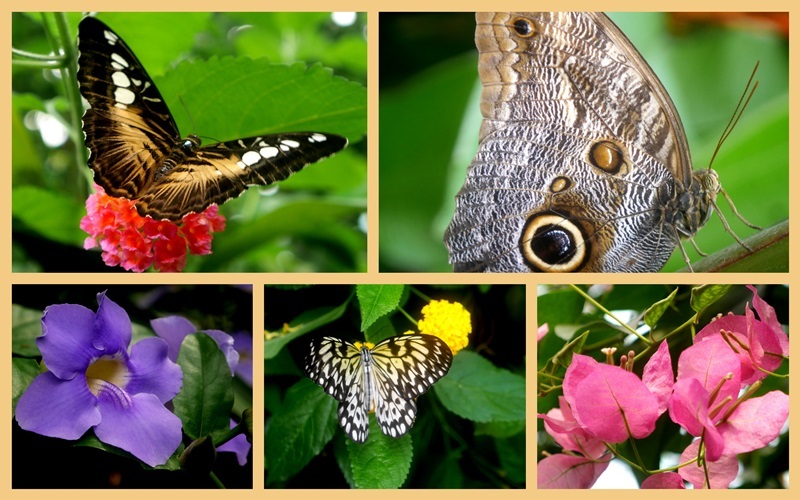 Is this the Butterfly World near Butchart Gardens? We have never been there. Maybe in September. What gorgeous photos, Lorrie and such a fun outing with a little one! Beautiful photos and a lovely day spent with your sweet one! Gorgeous colorful creatures! Your photos are beautiful. Beautiful ... Perfect outing with your budding photographer/naturalist! I would love this tour. This does look like a fun outing with a little girl! Isn't it fun to watch them take a photo?